This one day concert organized annually at the end of May is one of my all time favorite events and is the biggest concert in Slovenia. It is a Slovenian mini version of Glastonbury in England or Coachella in US with more than 20 mostly Slovenian and Croatian artists and some 30,000 spectators. Slovenian music scene has changed dramatically in the past few years and there are some wonderfully talented singers and groups that regularly perform at the concert. My favorite female singer at the moment is Neisha. What a voice! I mean, this is a country with just 2 million people yet with a bustling and hugely creative music industry! Yes, I know, Slovenian music is for most people a complete unknown but I've heard many youngsters from all over the world saying how much fun they had at the concert. There is a variety of possibilities. My favorite is to either spend a day out listening to music in a shadow of vast Pohorje forests or take a lift to upper end of the world-cup slope watching everything from the above. After a while I would return or sit at one of the many local bars and listen to music from a distance. 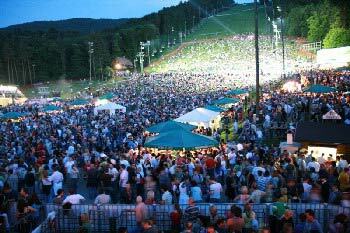 into the biggest concert gathering in Slovenia. The concert normally starts at 5pm and lasts until 1am, at least. Some performers move on to local nightclubs and so do the spectators and the party goes on until early morning hours which is actually pretty normal for Maribor pubs, bars and nightclubs. As for many other favorite events in Maribor this concert is really cheap. The tickets can be bought a few days in advance at the stall on the Liberty square in the center of Maribor or at the entrance on a day of the concert. In 2007 a single ticket was only $7 or $8 if you bought two with most of the money going into charity! 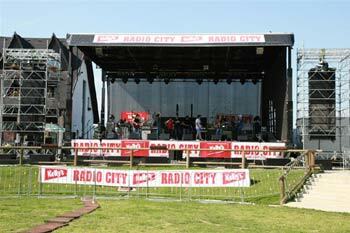 Namely, Radio City is very well known locally for supporting a number of charities taking care of those in need. The whole event is really great fun even if you don't speak Slovenian. 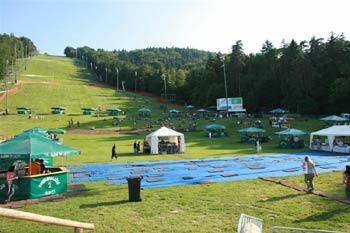 Happy people, happy music, lots of food and drinks, and beautiful Pohorje mountain are a guarantee for pure joy... Yep, this still is one of my favorite events!